NORTHERN Football League was where it all started for Jack Edwards at age twelve where his father, Craig, was already umpiring and took Jack to training to get involved. Not because Craig thought Jack would be a great umpire like himself, but more because young Jack enjoyed eating to many cheeseburgers. To Craig’s surprise, Jack exceeded expectations and developed a love for umpiring and in particular, enjoyed seeing close family friend, Darren Goldspink, umpire. In 2010, Jack made the trek into Victoria Park from Diamond Creek where he successfully made it onto the VFL Development Squad. After two years on the dev squad, former Director of Umpiring, Kevin Mitchell, gave him the ultimatum, come back fit or your times up. That suggestion from Kevin was enough for Jack, who proved himself in the 2012 preseason and secured himself the number 29 on his back for the next three seasons. 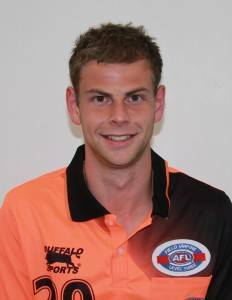 During this time, Jack umpired three consecutive Grand Finals in the 2012 TAC, 2013 Reserve and 2014 VFL Grand Final’s respectively which gave him the chance to be invited to an AFL Umpiring trial process after just 55 VFL Senior games. At 2014’s end, the AFL changed the concept of the trial process where they introduce an intense 3-day training and mental preparation camp as a part of the players combine based at Etihad Stadium. Through several fitness tests, interviews, mental based assignments and body screening tests, at the ripe age of 23, Jack became every umpires dream, an AFL Umpire. When Jack had experienced this result of getting elevated, he mentioned ‘my body went into shock, I dropped the phone and I was numb for the next 15 minutes’. Something no one could really comment on unless of course you have received this sort of phone call before. Although you could say, he made it at an early age and went through the ranks so quickly, however his determination, behaviours and attitude was to such a high standard he could only warrant the elevation. Jack soon debuted in the AFL where Hawthorn took on Melbourne on the hollowed turf of the MCG at a blockbuster time of 2:10pm on a sunny Saturday afternoon. What more can you want, right? After two seasons and 11 games, the most unfortunate and devastating news was received by Jack. Through his resilience, he saw the opportunity to head back to the VFL and continue to umpire a high level with the goal of getting a recall to the AFL. Fast forward to now, the Man In White writes this story as we acknowledge and congratulate Jack who notches up 100 VFL Senior Games and gets another photo on the wall at Vic Park. When asked what he loves about umpiring, he said, “The challenge, being around my mates and the opportunities we get doing something we love to do.” Ultimately, you could say this is why we all umpire! Jack, the VFUA, Man In White and all members wish you the best of luck this weekend for your 100th game.